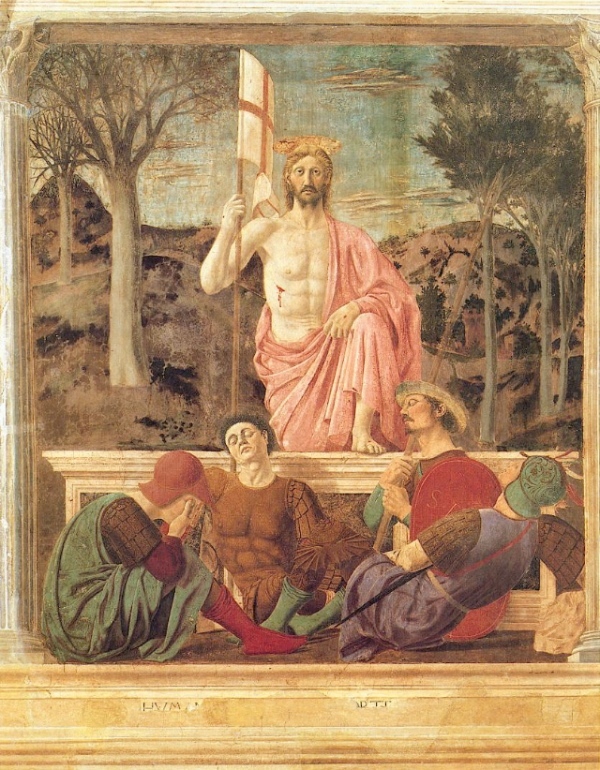 Two days ago we took the train from our local town of Umbertide to Sansepolcro, a town further north along the Upper Tiber Valley famous for being the home town of Renaisssance artist Piero della Francesca. The train makes a good day out, especially if you are travelling with kids, and, children permitting, you may be able to see some of Piero’s paintings as the museum is quite small and does not take long to look around. 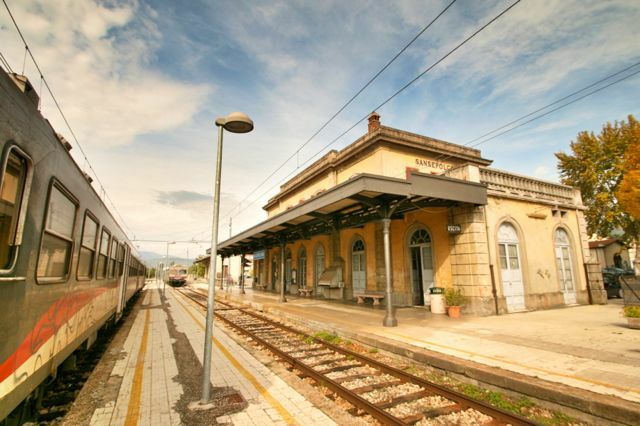 The railway once connected Umbertide with Gubbio and Arezzo, today, however, the privately owned Ferrovia Centrale Umbria (FCU) is a single line running from Sansepolcro at the northern extreme to Perugia in the south. If you are checking train times, be sure to look at times on the umbriamobilita.it website, you won’t find them on trenitalia.it . If you’ve used Italian trains before you’ll know you have to “validate” your ticket before the conductor comes along, the machines to do this are on the trains as you enter. We bought our tickets at the newspaper kiosk outside the station in Umbertide (€7 return) although it looked like you can also get them at the station ticket office on workdays. 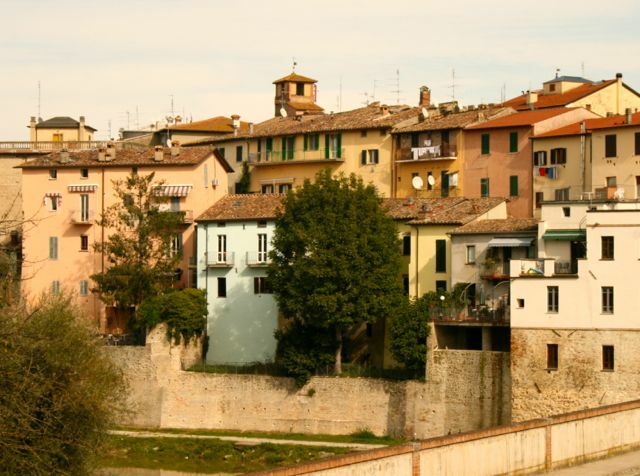 The journey to Sanespolcro takes around an hour and offers a different view of the Upper Tiber Valley to that of travelling in the car. The railway passes through fields, towns and past back gardens. From the train, I noticed how many Italians are very keen on planting vegetable plots on every available piece of garden, sometimes encroaching upon railway property with a row of extra tomatoes! I also noticed how popular makeshift sheds are, a wooden frame covered in corrugated metal or plastic sheets seemed to be the most common design. There are great views from elevated sections of railway across the countryside, as we approached stations there were often old industrial buildings in various states of decay. These abandoned buildings (along with the trains and the large amount of exposed concrete used in the station buildings) provided graffiti artists with an opportunity to show off their skills (or in most cases, the lack thereof). 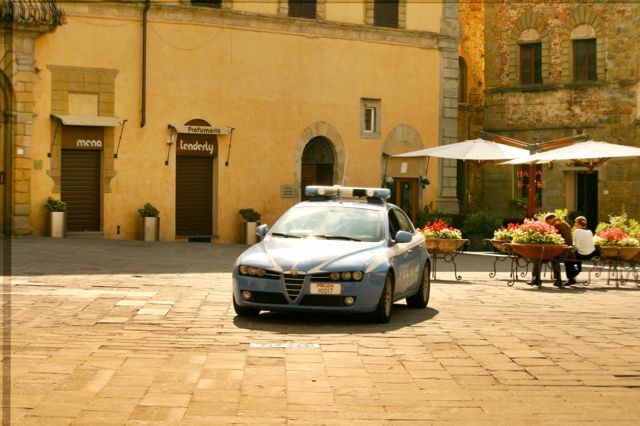 Finally, we arrived at Sansepolcro station, there are no signs to the town centre as you exit, the easiest way is to turn right and follow the town walls until you spot an entrance on the left. We wandered straight out and eventually made our way to the centre by turning right. Despite visiting Sansepolcro several times in the past I was not sure if we were going the right way. We eventually emerged in the main piazza and found the Museo Civico, home to two famous paintings by Piero della Francesca, the Resurrection and the Madonna della Misericordia.